Images from a fabulous Christmas service lead by the children in years 3 and 4 at St Michael's Church. More creative animations from year 6. These ones have a Christmas theme. Have a go at making your own animations - see ICT section of our website. Christmas is nearly here and what a magical time it is at school. We have been treated to our little ones in Nursery and Foundation sharing the Christmas story at Church, our Key Stage 1 children sharing their Christmas celebration wonderfully at school and our Key Stage 2 children performing ‘Tinsel and Tea Towels’ with such talent at Church following on from their ‘Waiting for Christmas’ involvement. We are so proud of all of them and grateful to our talented staff who have so often given freely of their time this season. Everywhere you look there are signs of the imminent arrival of Christmas; there is glitter, sequins, tinsel, angels, and wise men. Christmas cards are being shared, carols sung, Christmas music played, Christmas dinner has been eaten, class parties and discos enjoyed. The children have also sent their prayers and thoughts to Sandy Hook Elementary School in Newtown, Connecticut as they paused for a moment before singing Away in a Manger in a whole school assembly. Be near me, Lord Jesus, I ask Thee to stay, close by me forever, and love me, I pray! Bless all the dear children in Thy tender care and take us to heaven, to Live with Thee there. We cannot understand such tragedy, but all of us will pray and reflect on those who have lost loved ones during this Christmas tide and give thanks for the joy of children. So, as we look to 2013 we think back on 2012.... the dressing up and playground party for the Diamond Jubilee; the joining of all the pyramid schools to see the Olympic torch come through Wickham Market; our Olympic themed sports day; our new front school entrance being completed; our ‘new look’ website and blog; the launch of the Governors newsletter; new toilets for the children; the reception canopy extension; our new crossing patrol lady taking up her job; competitions won by individual children and school teams; the musical, artistic and sporting successes; the Gold award for the Junior Road Safety Officers; celebrations of Festivals with St Michaels Church; the development of outdoor learning with the support of Suffolk Wildlife Trust; the liaison days with Thomas Mills High School especially in music and technology; the children who left us this year and those children and adults who joined our school family. Throughout all of this, which only scratches the surface of what happens within a year at school, the children are learning and progressing as individuals through the direction and support of their teachers and other adults. We are so proud of all their achievements, which are made possible by the time, dedication and support of the staff and Governors at Sir Robert Hitcham’s CEVA Primary School and yourselves as parents. I wish all our families a very happy and peaceful Christmas. As you can see there are still classes without representation, please do put yourself forward if you feel you could contribute, just contact the school office in the first week of term. The council will act as a conduit for news and ideas so that we can move into 2013 together, with a shared understanding, in order to continue to give the very best opportunities for all our children. We will meet twice per term, during the school day, and this membership would be reviewed annually. The parent/carer members will represent the views of their fellow class families and feedback to you in a timely manner. The first meeting will be on Thursday 24 January 2013 at 9am at school. 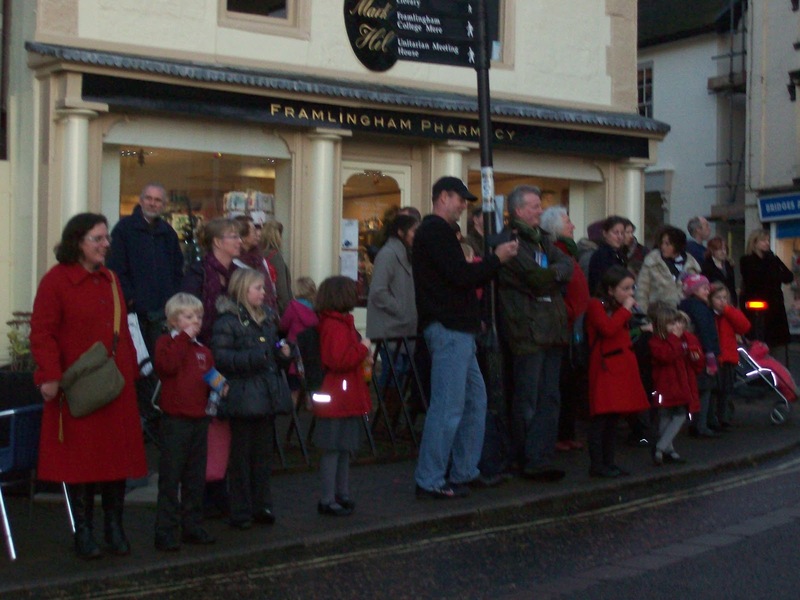 The Nursery children went shopping to buy the ingredients for a Christmas cake. We visited the stationers in Framlingham for decorations to go on the top. .....added the marzipan and a bow. Here are the finished cakes. Last week the children from classes LC, JC and CA did a fantastic job telling the story of Christmas through song and scenes. Narrators from year two told the story beautifully and the children sang a mixture of traditional hymns and songs. We all really enjoyed dressing up and have since been acting out the Nativity story with figures in the Activity area. We hope you enjoyed it too! Today a fine Christmas dinner was enjoyed by the children, staff and governors. A number of year 6 children did a great job as waitors. The staff joined in to help serve the food. Sam Walker provided his annual afternoon of entertainment. Some children from clas JC have been making Christmas animals such as these reindeer. Mrs Armstrong took our school choir to Framlingham's Mills Meadow Nursing home to sing carols to te residents. Afterwards the children wer given some refreshments and spent time chatting to the residents of Mills Meadow. Have some fun and learn some programming skills over the Christmas holiday. You can make your own stickman animations using this free software called PIVOT. 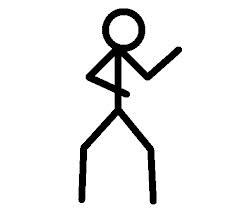 Our year 6 children have had a go at making dancing stickmen in GANGNAM style. Go to the ICT Section of our school website to download the software to your own computer. 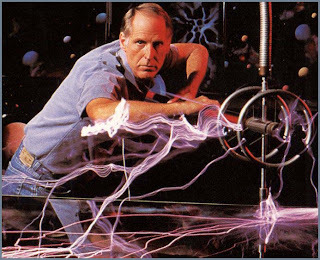 It only takes a few minute to start making your own animations. 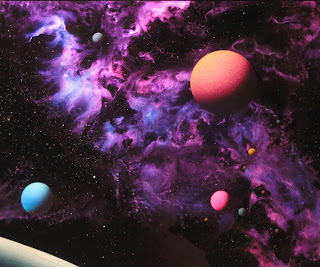 Out of This World Art Work! Year 6 have been creating art work (about space) inspired by artist Dave Archer. Everything was made (in collage) from recycled materials including sweet wrappers and cardboard. If you would like to enter this competition, then your Art work should be on the theme of “Magical Moment”, using any medium except bulky collage, no larger than A3 size and must not be mounted or laminated. The entry must be accompanied by a minimum donation of £2.00 for Cancer Research UK, and the child’s name, year and school name must be printed clearly on the back. Selected entries will be included in an exhibition at the Peter Pears Gallery in Aldeburgh from 8 - 10 March 2013. To have exhibited artwork returned it will need to be purchased at the Gallery. Please hand all entries in to our own school office by Thursday 24 January. 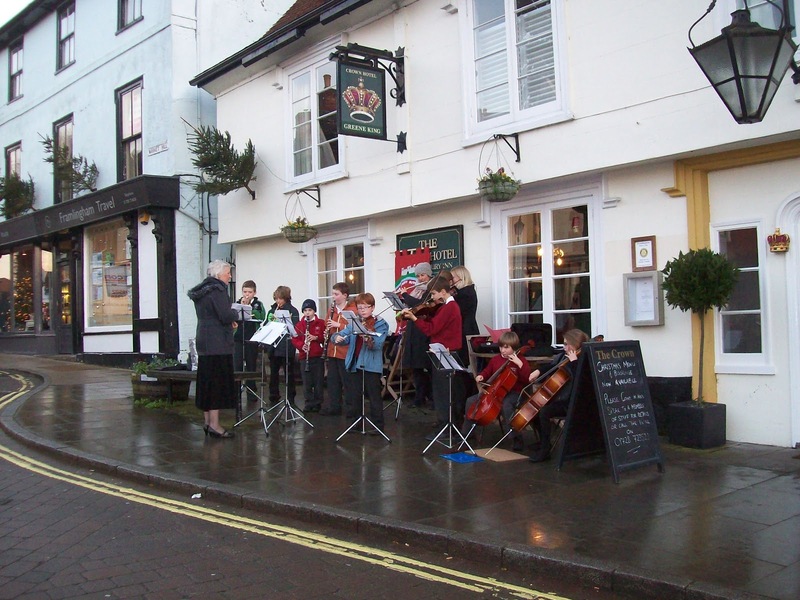 Yesterday (after school) our orchestra entertained people doing their shopping by playing some Christmas carols outside the Crown Hotel. A good crowd stayed to watch and listen. Earlier in the day the orchestra played 5 carols in the school assembly. DINNER MONEY CAN ONLY BE ACCEPTED on MONDAYS - you will need to provide packed lunches for the week if you do not pay on a Monday. Cheques should be made payable to Suffolk County Council (SCC) with your child’s name and class WRITTEN ON THE BACK please. ALL DINNER MONEY SHOULD BE HANDED IN TO THE CLASS TEACHER IN AN ENVELOPE THAT STATES: Child’s Name + Child’s Class + which days dinner money is for. HALF-TERM PAYMENT DUE BY MONDAY 14 JANUARY, PLEASE. Did you pay for Christmas lunch on Monday? The cost for this week is £11.50, the day £3.10, or £1.00 more is required if you have paid for the whole term but not for the Christmas lunch yet. St Michael’s Church at 1.30pm. Children in PLDD, RV & KV will be leading in this service and parents of these classes are warmly invited to attend. Parents may sit anywhere except in the first few reserved rows. A charity collection will be made at the end of the service. There will be cakes for sale from classes EM & NS this Friday after school in the front playground pavilion. Parents should sign in at the school office where admission application forms are available. Reception Applications for next year MUST be returned to the Admissions Team at Ipswich by 15 January 2013. For information go to: www.suffolk.gov.uk/admissionstoschools, you can apply online at www.suffolk.gov.uk/onlineadmissions but you will need to get a SIF form (Supplementary Information Form) from the school office. The Friends had a fantastic response with about 40 parents helping with supervision, signing in and out, selling tuck and glow sticks and corridor patrol over the 2 discos. Sincere thanks to all! The disco raised £519 this will go towards funding school projects over the coming year. DON’T FORGET YOUR PARTY CLOTHES ON FRIDAY. There are lots of items in our lost property container. Can we please encourage all children and parents to seek for lost items in the container sited at the end of the corridor at the top of the stairs above the Nursery. Please can we ask that parents ensure names are on all items brought into school – especially sweatshirts. ANY ITEMS NOT CLAIMED BY FRIDAY 21 DECEMBER WILL BE GIVEN TO CHARITY IN THE NEW YEAR. We would like to thank everyone who gave so generously to the charity collections at the end of the Foundation & KS1 Celebrations; the collections have raised £359 after covering costs. This will go to the EACH appeal. ORCHESTRA would welcome new members who play above Grade 1. Children should please see Mrs Armstrong in the first week of term, to start on Monday 14 January. There are only 2 places left! French Club starts on Monday 14 January at 12.30pm in Miss Montague's classroom. It's run by Kate Archer, a 'La Jolie Ronde' trained teacher and costs £40 for the term (£4 x 10 lessons). If you would like your child to join please fill out a form from the school office. Joyeux Noël! 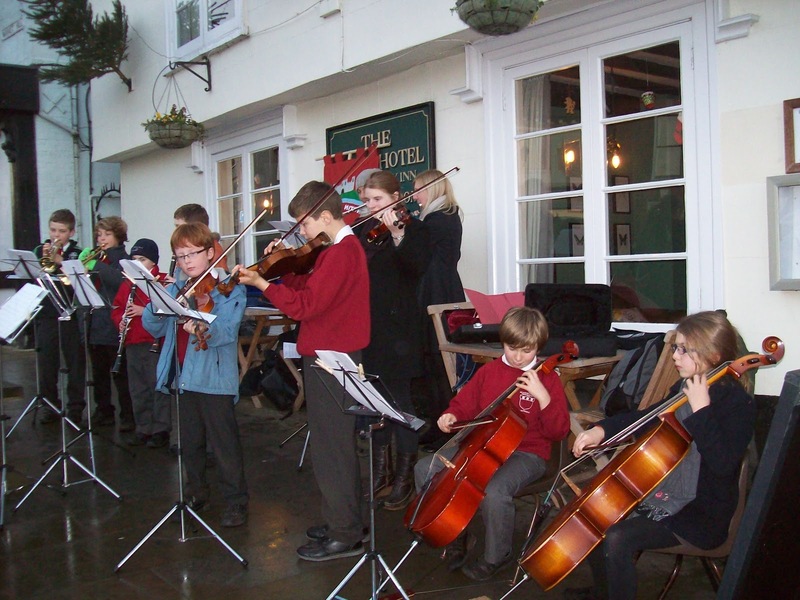 VIOLIN There are a few places left for violin lessons at school; either in a group (£3.50) or individual (£9.50). Please telephone Mrs Fell on 07768 986014 for details. Week 3 - Monday now Plain Chicken fillet; Tuesday now Pasta Bolognaise; Wednesday now Oriental Pork & Noodles; Thursday now Cheese & Tomato Pasta. CORRECTION – There will be NO MFSF Wind & Brass on Tuesday 8 January as stated on the last newsletter, the first lesson will be Tuesday 15 January. DOES have a non-pupil day on Monday 7 January. and happy celebrations for the New Year. Christmas is on its way!